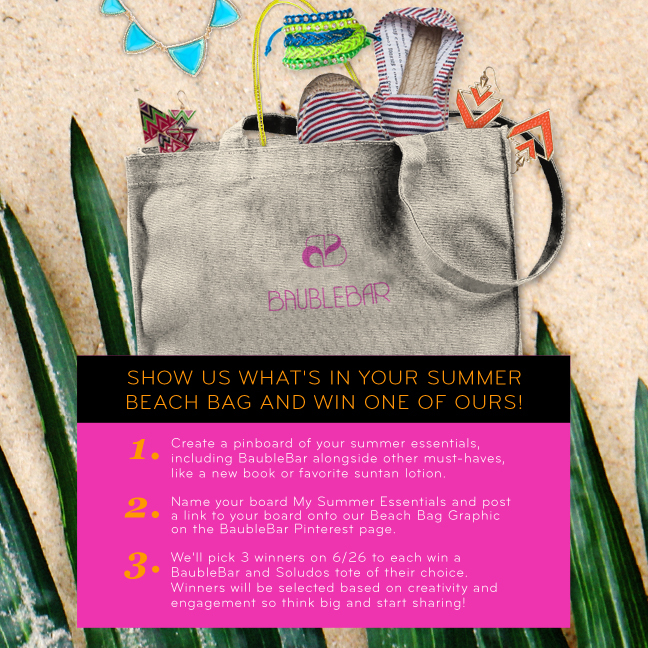 http://baublebar.com/ has partnered up to create four beach totes, inspired by five of its fav beach destinations: Cape Cod, Miami, Baja, LA and Hawaii! Take a look here. Each set retails for $80 and contains a pair of Soludos and 3-4 pieces of BaubleBar jewelry (exclusive to the set,) packaged together in a fun canvas tote! To support the contest, its launching a Pinterest contest! Details are below! I kind of gave up Pinterest for awhile, but this is a great opportunity! Thanks for sharing!